FAQs » Frequently Asked Questions (English) » How can I produce an annual report or year end summary receipt for my donors? You will be prompted for a year, and you'll be prompted as to which donors to include. 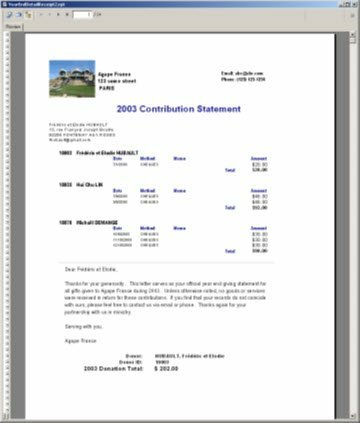 It produces a one-page letter per donor, giving them their grand total for the year. This file is not currently included with DonorWise, but for now, you can manually add it. First of all, download this zip file, and then extract the rpt file to a folder, such as your Desktop or your Documents folder. 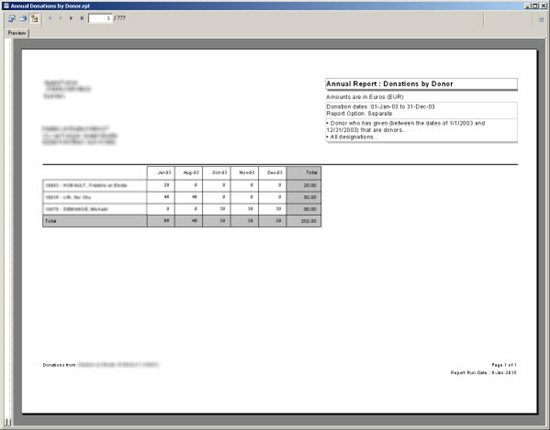 Then, in the "Run Reports" screen in DonorWise, click the "New Report" button, and select the file. When you run this report, you'll be prompted for the year, as well as if you want to limit which donors it refers to. If you want to provide more details, such as a break down of which projects the gifts were given to and which months the gifts were given in, there's another report you can choose. Under the "Reports" menu, select "Donations" and then "Annual Donations by Donor". You'll also be prompted for if you want to limit which donors or which designations are includes. You can just select all. Troy, I have a few questions about this report. 1) Is the only output format PDF? Is there a possibility for output into Word format? 2) Are there ways to exclude certain payment types (e.g. donors who donate through Canada Helps - CDNH already receive a tax receipt). Or would a better way to do this be to mark those payment types as non-tax receiptable? When you run the report, click the "Export Report" button on the tool bar. It's the first button, to the left of the print button. Then change the "Format" from Adobe PDF to one of the Microsoft Word options. 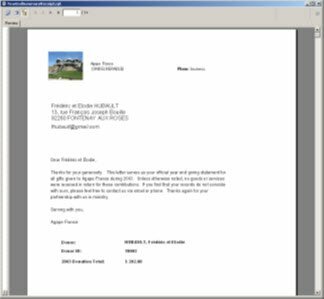 We have two questions about the 'Year End Summary Receipt'. We are using Donorwsie 3.3.16. 1. Our organizations email is cutoff in the upper-right portion of the report (e.g., "ministryaccounts@mobilzat"). How can we fix this? 2. Your screenshots show a logo/image in the report. How can we add our company logo? Hi Malachi, In the Tools|System Setup, under Receipting, you can add your ministry's logo. This will cause your logo to appear on the receipt. In terms of modifying the report, send me an email. I can make the email field longer so that your ministry's email address fits. I have a question regarding this report. I have a donor who needs an additional copy. 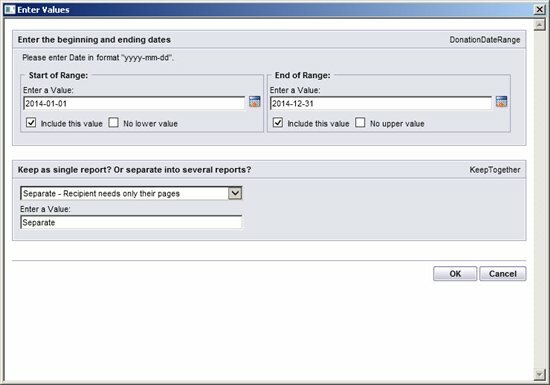 Is there a way to pull a year end statement for just one particular person? Mary, when running the report, you're prompted as to which donors to run it for. "Current contact" is one of those options.